CD review: "Comin' Home to Stay"
This review first appeared in the March 25, 1988 issue of the San Diego Evening Tribune. 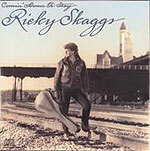 Ricky Skaggs is one of the most consistent artists in country music. You always know what you'll get with one ofhis albums  the best traditional country-western music on the market. The selection of tunes on his latest release, "Comin' Home to Stay," is as tasteful as Skaggs' performances of them. Gently swinging ballads have long been a Skaggs strength and staple, and "(Angel on My Mind) That's Why I'm Walkin'" stands with his best. Skaggs never forgets his bluegrass and mountain roots, either, this time including "If You Don't Believe the Bible," a white gospel piece. But the best songs are the duets Skaggs performs with his wife, Sharon White. Her soft voice, quite similar to that of Judy Collins, beautifully complements his rich tenor on "Home Is Wherever You Are" and "Lord, She Sure Is Good at Lovin' Me."